This is for the person who has a basic understanding of G&E equipment and is looking to begin focusing on lighting as an art form. It is highly recommended that you already take Basic Grip and Lighting or have similar experience prior to taking this workshop. 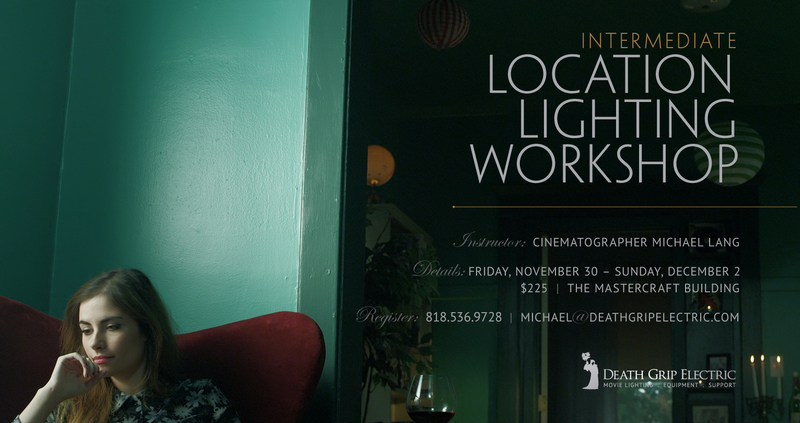 By traveling to different locations students will learn how to overcome the challenges of location lighting. Working with a script, actors, a director and cinematographer, students will face the responsibility of working as a crew and successfully setting the tone of the scene and executing the vision of the director. Students will learn how to use and shape existing light to their advantage, deal with the power requirements of location lighting as well as making creative choices with their lighting based on the story and production design. Friday November 30th the class will have an orientation from 7pm to 9pm. After introductions we will discuss our goals for the weekend. On Saturday Morning at 9am we will work in the Studio spending the morning working with bigger lighting instruments. First we will use a 5k Tungsten Fresnel to create soft beautiful light. Then we will move outside and use a 12k HMI. Discussion will include using the light in full sun as a fill light or using it as a key light on an overcast day. After Lunch we will travel to our first location and begin lighting a scene. The rest of the weekend will be spent lighting on location. Tuition for the workshop is $225+ tax. However if you have already completed my previous workshop you will be given a discounted rate of $199 + tax. This includes a catered lunch on Saturday and Sunday, drinks and snacks throughout the workshop and 25% off your next Death Grip equipment rental. This entry was posted on October 19, 2012 at 1:31 pm and is filed under Announcements, Workshops.You can follow any responses to this entry through the RSS 2.0 feed.You can leave a response, or trackback from your own site. Next: New Lighting Workshop July 27th & 28th, 2012!